I finished Fallout 3's main storyline a couple weeks ago, after about 40 hours of play. I spent most of those hours wandering the wasteland, halfheartedly pursuing optional questlines and allowing anything that appeared on the dusty horizon to completely distract me from my goals. I rambled haphazardly across the irradiated wilderness, poking my head into crumbling bunkers and scavenging my way through ghoul-infested tunnels. Though I spent my evenings fighting bemuscled mutants and deranged, sadistic bands of raiders, I think the one word that bests describes my experience with Fallout 3 is carefree. Despite the onerous specter of the apocalypse that manifested itself around every corner, I found its wide-open world intoxicating. I could, and did, do whatever I wanted. I forced myself to complete the main storyline much earlier than I would have liked, because I knew that when I hit the Level 20 cap my character's development would grind to a near-halt. I also knew that Bethesda's first two batches of downloadable content, Operation Anchorage and The Pitt, were just around the corner. Finally (and most importantly), I knew that Broken Steel, Fallout 3's third and last expansion due out this March, would wipe away Fallout 3's game-ending final mission and raise the level cap to 30. And so, with my plans for more exploration, leveling, and loot-gathering set over 'til March, I cleared out the main questline and prepared for downloadable distractions. Bethesda released the first installment, Operation: Anchorage, just last week. Operation Anchorage takes place almost entirely in a virtual reality-type simulation. It re-enacts a Chinese invasion of Alaska, in a slice of history that predates the original storyline. Like much of Fallout 3's fiction, Operation: Anchorage neatly treads the fine line between campy and cool. Unfortunately, it didn't scratch my itch for exploration, and it definitely didn't feel liberating. Imagine a single quest line ripped from Fallout 3's wide-open environment and packaged as a single piece of content, and you'll have a pretty good idea of what Operation: Anchorage feels like. Though it does allow players to complete certain story objectives in the order and fashion they see fit, it provides almost none of the free-roaming fun of the original game. Instead, it channels players down paths in a manner much more reminiscent of first-person shooters. 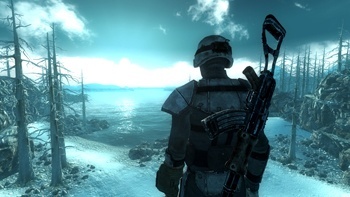 Fallout 3 is no first-person shooter, though, and its limitations in this regard are a bit more obvious in Operation Anchorage than they were in the original game. The awkward aiming and quirky enemy AI feel less forgivable. And waging war with mostly conventional weapons and enemies isn't nearly as novel as fighting mirelurks with a handcrafted Shiskebab or tossing Nuka-Grenades at deathclaws. Operation Anchorage also lacks the constant loot payoff of Fallout 3. Unlike the item-packed boxes and crates that litter the main game, the simulation's assortment of containers can't be opened or rummaged through. Bodies can't be searched, either. Vanquished enemies vaporize in crackles of energy, their armor and weaponry vanishing with them. The constant strategic juggling of gear, guns, and healing items in the main game is done away with completely, replaced by a vintage FPS system of glowing health and ammo stations at key points along the path. Nearly all of these of these design factors are, admittedly, completely consistent with Operation Anchorage's virtual reality circumstances. And the virtual setting is easily defensible, given the past and distant setting. Even the mostly linear structure seems an obvious approach for a story-based piece of downloadable content. Operation Anchorage may be an expansion pack, but it doesn't really feel like more Fallout 3. It's an interesting diversion, one that breaks from the original game's conventions and takes off, albeit briefly, in a very different direction. Players that sought structure and direction from the main game may find it novel and exhilarating. Those who reveled in more random adventures, as I did, might find it unfamiliar and claustrophobic. Either way, Operation Anchorage doesn't last for more than about three or four hours. And when it's over players will have acquired some very cool new gear. Personally, I've no desire to return to Alaska. My trip through the frozen north just made me pine for the burnt-over environs of the capitol. But knowing that I'll have a Gauss Rifle and Shock Sword in my inventory when Broken Steel re-opens the wasteland next month, I think it was probably worth the trip. Adam LaMosca is a writer, researcher, and gamer in Portland, Oregon.